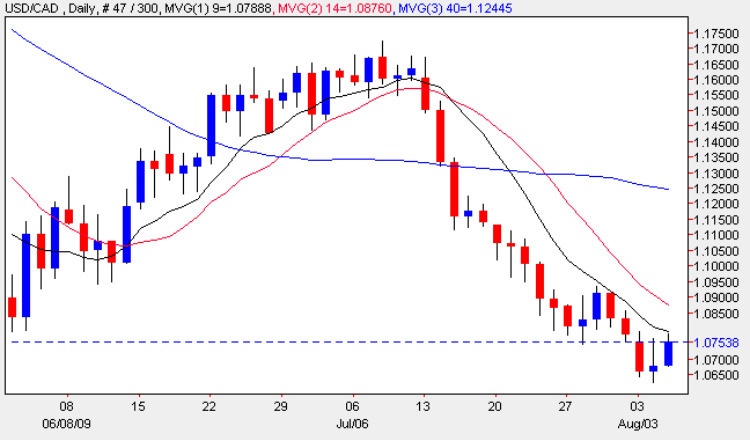 Yesterday’s comeback by the US Dollar against the Loonie is hardly surprising given the strength and depth of its recent fall with the pair ending the trading session on a bullish “gravestone” doji candle which is often the signal for a short term squeeze or rally. Indeed this signal has been validated in this morning’s early trading. However, the fact remains that general market sentiment towards the US Dollar is still decidedly negative and unlikely to change in the near future. As a result any upswings in this pair should be viewed as opportunities to sell into the market as any rally is likely to be short lived with the 9 day moving average seeming to act as a barrier to any move higher. All the items of fundamental news on the economic calendar for the US are covered on the main Eurodollar site while for Canada we have to wait until tomorrow for the Building Permits Data.